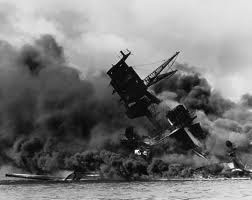 74 years later another "Day that will live in infamy" occurred. Civil War 2.0 by Christmas..Congratulations America, this is what our laziness, complacency and lack of vigilance, ignorance of history has earned us. A direct communist attack from our OWN WHITE HOUSE..the Marxists and Comunists are HERE And winning mightily...YOU REAP WHAT YOU SOW!!!! Sen McCarthy was right all along. 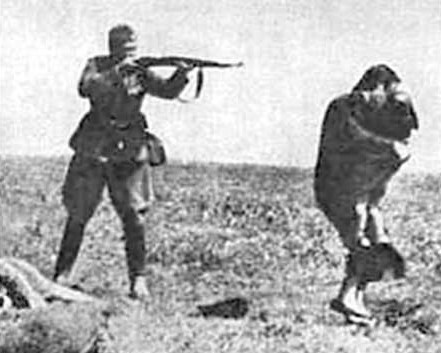 Oh yes, a day that will be remembered LIVE in INFAMY is correct, in spades! My great uncles body rest in the hull of that ship, may he rest in peace, may those members of ny family that served in both the European and Pacific theatres that have followed him to their reward rest in peace! My grandfather was a gunners mate 1st class on the USS Nevada. He ended up being acting gun captain on main battery 3. He saw the war clouds on the horizon and transferred to enlisted aviator school two weeks before Pearl Harbor was attacked. He would tell me the story of his shipmates and their incredible, heroic battle against the Japanese attack with tears in his eyes and choked voice. The story of the USS Nevada's action on that day is amazing on many levels. The 5 inch batteries on the Nevada were legendary for their speed and accuracy - they actually shot down the torpedo bomber that torpedoed the ship. Junior Officers and a skeleton crew saved the ship from complete destruction and grounded it in a way to prevent blocking the harbor which is serviced by a very narrow long inlet. Perhaps 12/8 should be defecate on FDRs grave day. Having provoked the japanese with a shipping embargo, then attacking with the Flying Tigers as the proxy cutout, then requiring ships to be bottled up inside Pearl Harbor despite Navy opposition, then delaying advance warning to commanders in Hawaii - he was personally responsible for the US entry into WWII. No doubt the japs were a bloodthirsty lot - the US could have avoided engagement altogether. I was there in 2007. Most somber tomb i have ever visited. Thank you, sailors. You perished in a cause greater than man. And we have let your memory go to waste. I, on behalf of America, apologise for that. Tears in my eyes and pain in my heart, Thanks for the ultimate sacrifice! Godspeed sailors! You completed your mission. I watched the Pearl Harbor attack from the very first dive bombers over Ford Island to last high level attack over the harbor. The Jap torpedo planes that went after our battleships came by our home 100 to 150 feet away at house top level. Interesting thought, from an old Chief Boatswains Mate I work with at wallyworld, he said the USS Arizona is still a "Commissioned Ship" in The US Navy!!! She was never "De-Commissioned! I will remember. Dad was there. We never learned all about his experiences. About this time most years, the subject would come up and we would talk some. Dad would make comment and sometimes talk a little more, but it would never last too long. just do what we could to comfort him. In small pieces over the years we learned that his ship was fortunate enough to have very light casualties. Seems that more painful was being assigned to a recovery detail after the attack was over. Memories of pulling burned bodies out of the water seemed to haunt him. Also, in the days following the attack, one could hear the hammering on the hull of those entombed yet still alive. As could be expected, this experience brought about the pain that causes anger and a desire to fight. As the submarine fleet was not destroyed, that seemed the opportunity to fight. Dad spent the rest of the war in the Pacific Submarine Fleet. Not to mention the fact that while there were FIVE Enigma machines at the war dept. there were NONE at Pearl. The more I learn about FDR, the more I come to LOATHE AND DESPISE him. I consider him and Lincoln to be two of the worst traitors to the constitution ever. Obozo - bad as he is - isn't even in their league.